It’s the longest day of the year, and the best evening for artistic fun at UNC Greensboro’s Weatherspoon Art Museum. Friday, June 22, 6 to 9 p.m., the museum hosts its 14th annual Summer Solstice celebration in the Sculpture Garden, and during the celebration, galleries are open for viewing. Between food, musical entertainment, kids’ activities and conversation, Solstice revelers can also experience nearly every medium across three lively exhibitions curated by Elaine D. Gustafson. “Extreme Measures” puts bold pieces, from WAM’s permanent collection into conversation with each other. A wild array of melted plastic chairs, buckets and coat hangers stands in contrast to a somber statue of a 1930’s-era man listening to a radio “fireside chat” broadcast by Franklin D. Roosevelt. Among the small-size works in “Extreme Measures” is a box that allows the viewer to peer into a minuscule scene of the interior of a Manhattan studio. Many of the other pieces are large and in charge. Energetic colors and lively patterns surround, and the juxtapositions “give people something to talk about,” says Gustafson. It’s art that beckons audiences of all types – from kids attending the UNCG Summer Arts and Design camp to seasoned connoisseurs seeking a glimpse of unusual collection items. 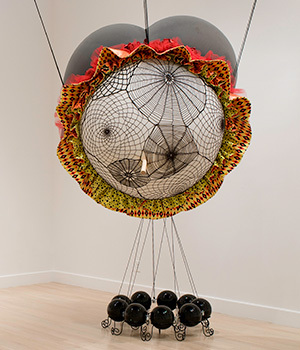 “Extreme Measures” is open through July 15. Can’t travel this summer or wish to revisit cities you know? Across the hall, “City, Village, Exurbia: Prints and Drawings from the Collection” shows off a variety of European and American landscapes. The fine details of bridges and smokestacks, castles and skyscrapers emerge through diverse illustration styles. From Verona to New York City, go on a summer tour through the artists’ eyes. 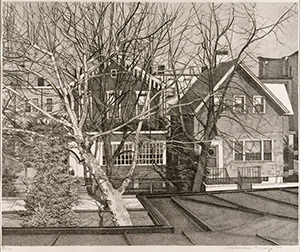 There’s even a 1942 sketch of Tate Street, for those who like to stay close to home. “City, Village, Exurbia” is open through Aug. 26. Lastly, in the first-floor gallery, a video installation, “migration (empire)” by Doug Aitken, gets a little wild. 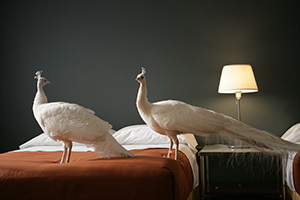 For the video, the artist hosted a variety of indigenous animals in a roadside hotel and documented their experience. You may see some ruffled feathers here and there. In the adjacent gallery, Weatherspoon collection items repeat Aitken’s motifs and provide reflection on his concept of displacement. Together, the two displays are “Single Channel-Catalyst III,” open through Sept. 30. In addition to the Summer Solstice Party, the Weatherspoon will host an evening event series, Tours & Treats, three times throughout the summer – June 14, July 12 and Aug. 9. The free events include 30-minute guided tours, hands-on activities and cool treats in the Sculpture Garden. Find more information about Tours & Treats here. The Solstice Party is free and open to the public, and WAM members receive two complimentary drink tickets. Visit the WAM website for regular visiting hours.